It seems to depend on the line endings of the source text – in this case I am copying from SQL Server Management Studio. If I paste into Excel first and re-copy then it pastes correctly into EmEditor. Unfortunately, I am having a hard time understanding the issue. Can you please explain the issue in different words in details? Can you reproduce the issue without SQL Server Management Studio? This is actually how EmEditor works currently. You should switch to the Block Selection mode BEFORE you copy the text. I understand some people would like an alternative behavior, and I will think about adding the option in future versions. In that case I would propose supporting the case where we’re copying text from other applications – like SSMS apparently copying a column is the same as copying lines w/CRLFs. The recent beta version changes the behavior per your request. This change is very useful, especially when create Batch Replace List or similar TSV files from copy-data. Before v17.1.0 beta 4, need to paste into Excel two columns separately first, and then copy & paste back to EmEditor. Now it can be done in EmEditor. In addition, suggest also consider to add an option to CVS mode for this change in future version. 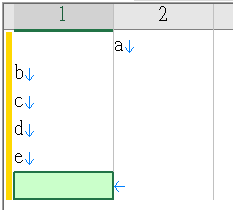 If paste to EmEditor CVS mode column 2 or later, “a” position is correct, but “b”~”e” position will be on the unexpected column 1. 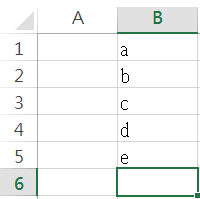 If paste to Excel column B or later, “a” position is correct, and “b”~”e” position is correct as well. In the past year, I had depended on Excel to help handle these, and then copy into EmEditor more than fifty times. Now, I can no need for Excel on this, thanks!